AcuPlan Hawaii Honolulu Hawaii :: Director - Joni Kroll, D.Ac. acupuncturist who didn't speak English, but certainly knew how to treat menstrual cramps. She left her first treatment, not only without pain, but also profoundly changed by the experience. She discovered that a school on Oahu was beginning a new semester and she qualified for admission, having already completed a pre-med program. She began classes in Oriental Medicine three weeks after her first acupuncture treatment. 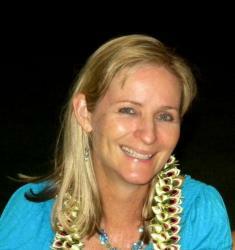 Dr. Joni graduated with honors from the Oriental Medical Institute in Honolulu, Hawaii and opened her practice in 1989. She is board certified in acupuncture orthopedics and a Diplomat of the National Certification of Acupuncture and Oriental Medicine (NCCAOM). She completed her training in (NAET) Nambudripad's Allergy Elimination Technique) in 1996 and has successfully treated over a thousand adults and children for allergies and asthma. She also specializes in the treatment of pregnant women, infertility, and menopause. She is a past president of the Hawaii Acupuncture Association, co-founder of AcuPlan Hawaii, a member of the American Association of Oriental Medicine and the National Sports Acupuncture Association. Dr. Joni shares clinic space with her husband of twenty years, Dr. Douglas Kroll, DC, her brother, Gordon Spencer, a licensed massage therapist and her associate, Mariya Gold, L.Ac. Dr. Joni is the proud mother of two active boys, Eric and Evan. twice per month. He seemed like he was always sick…really bad wheezing. Every time he got sick we were in the Emergency Room until the wee hours of the morning getting him steroid shots to open his lungs, nebulizer treatment and chest x-rays. After just a few acupuncture treatments (with laser, not needles), we really started noticing improvements. Now he is hardly ever sick, which is such a relief. If he does catch a cold, it goes away like normal. He no longer uses his nebulizer and I don't have to give him any of the steroid medicine. The turn-around is totally amazing. We take him in once a month to see Dr. Joni for wellness visits now. We haven't been to the ER once since starting acupuncture!" Infertility - "I had been trying to get pregnant for years. I had one failed IVF and everything else prior to that. Being 49 years old, I knew my chances were slim, but I had read that acupuncture increased the success of IVF by over 25%, so I decided to give it one more try using acupuncture the month prior and pre and post treatments on the day of transfer. Dr. Joni is wonderful and so supportive. I am so happy to say that our baby girl, Eve, has now joined our family!" Migraines - "I use to suffer with severe migraine headaches, averaging at least two migraines a month that lasted 3 to 7 days each. I was on multiple Rx drugs with very little relief. It took me about 10 treatments before the migraines were totally gone, and now I've gone 7 years without a migraine. I still come in once every few months just for balancing treatments. It's totally worth it."